Still wondering whether the GM Diet Plan works or not? Then, you should definitely read this review of the General Motors Diet, a 7 day diet plan that will result in at least 4 to 7 Kg weight loss if done properly as per the regimen. The General Motors Diet has become very popular basically due to its quick weight loss results. Let us find out why the GM diet is more beneficial compared to other weight loss diets that are both difficult to follow as well takes longer periods to lose weight. The GM diet is actually intended for people who wanted to lose at least 10 to 17 pounds (lbs) per week naturally and without affecting their body in a negative manner. Not just the outlook, the diet also helps in cleansing and detoxifying your system so that you look fresh both outside and inside after the 1 week of diet program. The beauty of this diet plan is that the suggested foods burn more calories than they give back to the body in caloric value. That is the reason why many people who followed the regimen will try to repeat it once every few months in order to flush their system of impurities and be healthy. There is no risk in following this regimen regularly as it is 100% natural way to lose weight and keep our system healthy. GM Diet Reviews: Does it Work? 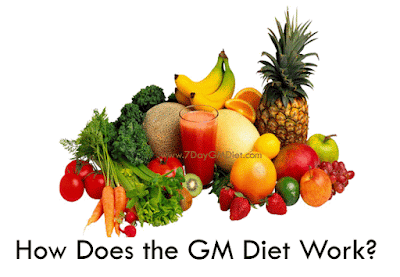 In order to review the GM diet program, first we should talk about how the diet works, benefits and side effects of the General Motors diet plan. Only then, we can come to a conclusion, whether the GM diet actually works or not. How Does the GM Diet Work? Is it Effective in Losing Weight? Well, if you wanted to know the answer to this question, you should first know what happens internally when you follow the diet. Contrary what some people say, the GM diet is one of the most effective ways to detoxify your body. This is mainly because you’ll be eating the low carb fruits and vegetables and not any unhealthy proteins and carbs during the first three days of the diet. This would help the body enter into detox mode and all the impurities (toxins) in your body will be flushed out. For this to happen, you should drink a minimum of 2 to 3 liters of water each day. The positive effects of detoxification are quick weight loss, improved digestion and regular bowel movement. As I said earlier, the improved digestion is because of the detoxification process, and also thanks to the high fiber foods that you eat during the week. Since, they are low in sugar and calories, they can be easily absorbed by your body. And, as you know, drinking enough water helps in absorbing the fiber food very easily, thereby improving your metabolism. One of the main reasons why a lot of people suffer with overweight issues is the irregular bowel movement. In such cases, the wastes are trapped inside their body, thereby adding up additional weight to your actual weight. When you eat high fiber content and drink 2-3 liters of water every day, the solids are easily flushed out. So, if you’re suffering with constipation issues, then your problem will be resolved if you follow the GM diet once. When your body receives these three health benefits, you’ll automatically lose weight without performing any exercises. However, moderate exercise is suggested as it helps in tightening your lose skin after losing a lot of weight. So, perform HIIT workouts or Yogasanas from the 4th day onwards during the GM diet and on all days after completing the GM diet. Light headache in the first two days. Some people who don’t diversify the foods and eat only a single variety will suffer from Nausea. And hence, it is advised to mix different varieties of suggested foods to kill nausea and boredom. Not recommended for pregnant women. They can follow only 6 months after the delivery. It is not suitable or recommended for Diabetic patients. The first two side effects can be avoided by drinking enough water per day as water helps your body from getting hydrated and thus prevents those difficulties like headaches, nausea etc.. So from this review of GM diet plan, we’ve clearly known that the General Motors diet plan is one of the best weight loss diets that help you in losing around 5 to 7 kgs in just a week’s time. Here is the detailed 7 day diet plan for weight loss. Click on the specific days to access the full information. 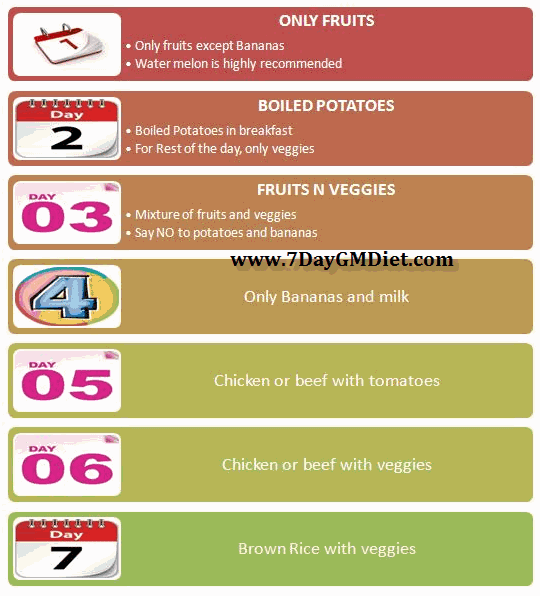 Day 3 – Combination of Day 1 & 2 but should skip few foods. Do check the Ideal weight chart before starting this diet plan and set a weight loss goal. Please remember that you should give a gap of at least 5 to 7 days before starting the next GM diet session. Likewise, you can follow this General Motors diet program until you reach your ideal weight. While you’re not on the 7 day diet, it is advised to follow either the 1200 calorie meal plan or 1500 calorie meal plan or 1800 calorie meal plan to avoid any weight gain due to unhealthy lifestyle. Please read this guide to know how many calories you need per day. Can I Lose Weight on the GM Diet? Of course, Yes! Most of the followers have lost a minimum of 4 kgs to a maximum of 7 kgs on this diet. If you want to lose more pounds, then you can repeat this diet until you lose all your extra weight. But, remember to leave a minimum of 5 to 7 days gap before starting another session as it would have negative effects on your body.